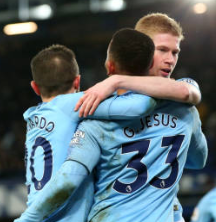 Title holders Manchester City are back on top of the Premier League table after a deserved 2-0 victory away to Everton on Wednesday night. The victory sees the Citizens leapfrog Liverpool courtesy of a superior goal difference, albeit having played an extra game. Pep Guardiola’s side came up against a hard-working Everton side, but the visitors eventually took the lead just before the break when Aymeric Laporte headed home from a David Silva free-kick. In the second-half, the Citizens spurned a number of chances to increase their lead, with Sergio Aguero and Raheem Sterling both failing to make the most of good opportunities. The Toffees struggled to create anything of note in attack and at the death, City doubled their advantage with Gabriel Jesus heading in after his first effort had been saved by Jordan Pickford. The victory sees City go top of the table for the first time since mid December, with the pressure now firmly on Liverpool to regain their lead at the weekend.